I enjoy watching Nancy Pelosi do politics. I enjoy it in the way that I like watching Tina Turner perform: You know you’re in the hands of a maestro, someone drawing upon decades of expertise, who does not pretend at false modesty, who has no patience for your foolishness. Someone who can tell a story with the tiniest gesture. One of those tiny gestures echoed around the world last week. There was Ms. Pelosi, Speaker of the House and thus the most powerful woman in American politics, watching Donald Trump give his State of the Union address. I say watched but, really, she left the watching to Vice-President Mike Pence, who gazed adoringly at the President the way you’d gaze at your spouse as they receive a prize from the Rotary Club. Ms. Pelosi rifled through the printed speech, looked around the chamber and when the most corrosive president of modern times spoke about the need for unity across party lines, she stood up and clapped. Ms. Pelosi's daughter recognized the applause she gave Mr. Trump during his State of the Union address. Ms. Pelosi said, after the State of the Union speech, that she did not intend to clap sarcastically, but I suspect her nose grew a tiny bit with that claim. She knows what she’s doing, and that’s what makes her terrifying to her opponents – both Republicans and rebellious members of her own party. She’s survived more political hit jobs than Rasputin. “The Republican National Committee hung a banner at its headquarters,” The New York Times reported, “that said FIRE NANCY PELOSI.” The Republicans also spent US$65-million on ads attacking her during the 2010 midterms. The threat was coming from inside the House as well; younger members of her own party tried to wrest the speaker’s gavel from her hands after last November’s midterm elections. You may notice who still has it. Let’s put it this way: I would not want to meet Nancy Pelosi in a dark alley if I had sold her out. 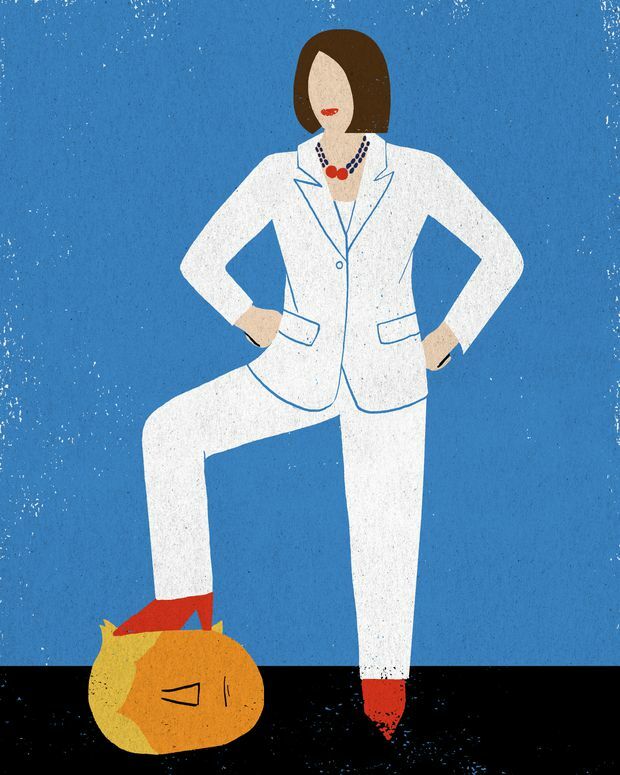 She’s a 78-year-old street fighter in a pantsuit the colour of clementines (the colour is significant, she told The New York Times, because it represents the gun-control movement). “They come after me because I’m effective,” she told Rolling Stone magazine. And she has been, whether it was wrestling the votes to secure the passage of the Affordable Care Act, or facing down Mr. Trump during the government shutdown crisis, when he was looking for US$5-billion to build a wall against phantom marauders. But that effectiveness doesn’t necessarily translate to public popularity (her approval rating recently climbed to 42 per cent in a CNN poll, which isn’t great but still the highest it’s been since she first became House Speaker in 2007). Progressive members of her own party think she’s part of the old guard, a tactician rather than a visionary, yet they fall into line when she demands it. Everyone wants to march behind a general who makes the opposing army quail. And what a fresh and inspiring army of resistance it is. The women of the Democratic Party are striking fear into the hearts of their political opponents, and it’s wonderful to see. They’re women of colour who have been elected to Congress for the first time. They’re grandmothers and army veterans and community activists, and they’re refusing to be silenced. They know that their country wants to hear new thinking on tax rates and immigration and reproductive choice. They know they’ve got boldness on their side. It’s quite something to watch the wealthy donor class starting to tremble in its wingtips when Congresswoman Alexandria Ocasio-Cortez starts talking about marginal tax rates. They try to discredit her as a simpleton, a dance-crazy airhead who doesn’t understand numbers. Until, that is, economists begin pointing out that her ideas on progressive taxation used to be fairly standard, even among Republicans. Oh, and the viewers of Fox News – not known for their Marxist tendencies – also support higher taxes on top earners. There’s a new vanguard in American politics, and it looks like presidential candidate Kamala Harris as well as Stacey Abrams, who ran a powerful campaign for governor of Georgia and would have become the first black woman to run a state if she’d won. She didn’t, but she was asked to deliver the Democratic response to President Trump’s State of the Union speech. She used her time to talk about the “uncommon grace of community.” She said, “America is made stronger by the presence of immigrants, not walls.” Talk about terrifying ideas. But they are, to the people who currently hold power and do not want to give it up. It’s frightening to them to see so many women gathered in solidarity, as they were at the State of the Union address, wearing white to honour the suffragettes who fought for women’s votes in the United States more than a century ago. On Twitter, a popular meme showed the congresswomen dressed in straitjackets instead. If that doesn’t reek of fear, I’m not sure what does. Ms. Pelosi was wearing white that night, too. She knows the power of a gesture, and a movement.